One of the favorite games for babies is play dough. In honor of National Play Doh Day on September 16, this post will look at the benefits of play dough for fine motor skill development. Observe the baby in the above video from Jordan Lee’s you tube channel. One of the easiest activities for a baby to do with the dough is to press his fingers into it. This develops strength in the fingers and awareness of the changing depth of the dough. Eventually you can teach baby to pull small pieces off of a larger piece of dough, developing finger dexterity. Learning to press a cookie cutter or a stamp into the dough also teaches coordination and develops strength. Babies also learn colors from playing with play dough. Even the play dough containers can be instructional tools if you teach baby to put the dough in and take the dough out of the containers. Play Doh commercial brand is sold in small canisters. For homemade play dough see if you can purchase some interestingly shaped and/or colored small containers for each color of dough. 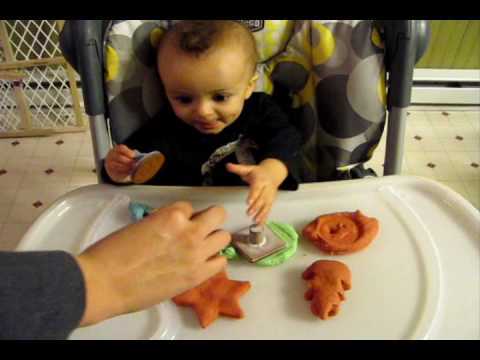 Babies play with play dough usually after the age of one year old. At this age they are rapidly developing their fine motor skills. They also use their fine motor skills for picking up food when they are eating. I recommend keeping the play dough off of the high chair tray. That is a place for food and therefore the things placed here and picked up or squished with fingers usually go into the mouth. Try playing with the play dough on a small table about the height of a coffee table. Baby can stand and play with it or it can be placed on one of the small tables that comes with chairs for toddlers. Show them with your fingers how to press into a small ball of dough and then let them explore the texture. Keep your eyes on baby so he does not put a piece in his mouth! 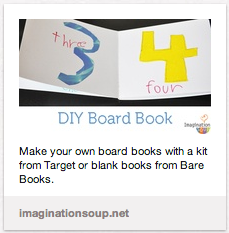 There are an abundance of homemade play dough recipes available on the internet. It is worthwhile to find one and make it for your baby. The homemade version is made from simple edible ingredients such as flour and salt and should pose no problems if baby put the play dough in his mouth when you are not looking. Simply google “best homemade play dough recipe” or search youtube if you prefer to watch someone make the recipe. You can even find gluten free play dough recipes if you have a baby allergic to gluten. A friend of mine who is also a grandmother and nursery school teacher shared with me which of the songs for baby she felt brought the most emotion to the mothers. “Your Are My Sunshine” does it every time. “Each time a mother sings this song to her baby she can not help but feel so much love and joy for her beautiful child,” she explained. I decided to find an easy to learn version of the song for the mothers of our stellar caterpillars to learn. The above video from Cedrique Rababut’s youtube channel is a sweet version of the song that includes the lyrics for you to sing along. The accompanying photo essay includes gorgeous nature shots, adorable animal pics, and visual images of love and affection. So, I hung my head and cried. How do babies learn to talk? Babies learn speech through imitation of the sounds and words they hear from their parents, grandparents, aunts, uncles, neighbors, siblings, and nannies. First they learn syllables such as “Ma” or “Ba.” Soon they learn the entire word, i.e., “Ball.” First words often include “Ball, Doll, Block, Book, Dog, Cat, ” and of course “Mama” and “DaDa.” It will be much easier for them to learn the ABCs later if they know the “ABC Song.” Although they usually do not learn their ABCs until they are toddlers, it is great to familiarize them with the rhythm of the tune from early on. 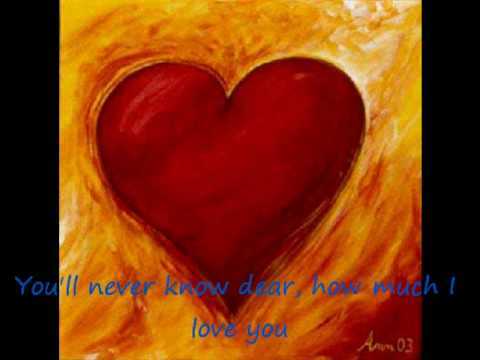 It is also an easy song for a new mom to learn who does not remember or know many baby songs. If you know your ABCs you can quickly learn the tune and sing it to baby. 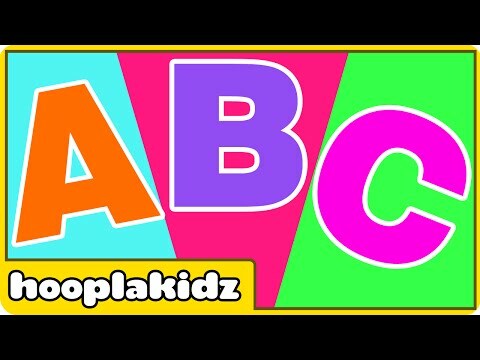 Practice the song in the above video from Hooplakidz youtube channel. Remember that babies are very curious about how you make those mysterious sounds that come out of your mouth. They want to know how to do it and they want to try it. They want to learn to sing and speak as you do. If you move your face close to baby’s face as you sing (about 8 inches away), she can watch your mouth move and make the shapes of the sounds and words. Sometimes baby will try and imitate you, even at a very young age. It helps if you exaggerate the words so they can watch your mouth change shapes. Try practicing this in front of a mirror. If you are a shy and soft spoken person this will feel silly, but your baby will enjoy this game. Sometimes baby will reach her hands up to your mouth and try and reach inside to find out “What is going on in there?” Allow her to touch your moving lips as you sing. She will learn a lot from this exploration. Choose a favorite song to sing often and baby will become familiar with the rhythm and sounds of the words. The most common moral taken from this popular song for babies is about getting back up again when you get knocked down or that life has cycles of events and/or emotions. By pairing the song “Coming Around Again” with “Itsy Bitsy Spider,” Carly Simon drives this point home in an endearing way. Watch her perform the two songs together in a live performance on Martha’s Vineyard, video from Carly Simon’s youtube channel. 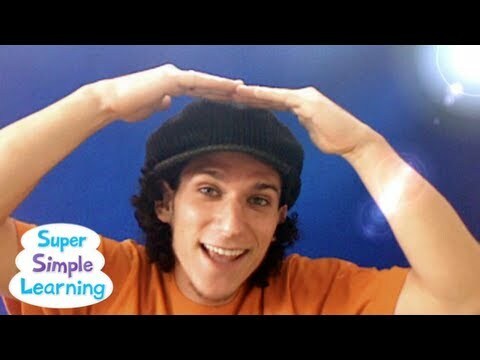 Learn the “Itsy Bitsy Spider” lyrics and hand motions (see video below) to sing to baby. The above video from SuperSimpleSongs’ youtube channel shows the hand motions very clearly and the option of using the words “Eensey Weensey” rather than “Itsy Bitsy” to describe the spider. Babies love to watch the hand motions for this song. It is especially entertaining for them when you exaggerate some of the hand motions. For example, take your hands up high above your head for “climbed up the water spout,” tickle baby lightly as your hands draw “down came the rain,” and tilt your head with your arms from side to side for “out came the sun.” Observe how baby tilts her head to look up high and smiles as you sway side to side. Sing this song often and baby will enjoy the familiarity of the tune and the movements. Eventually, she will learn them with you. Babies are motivated by curiosity and exploration. 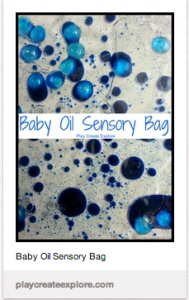 Learn some DIY Mommy Crafts to make at home for baby play to encourage motor skill development and the learning that occurs through the five senses. 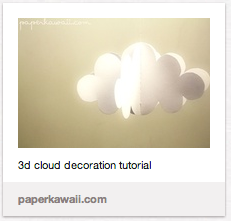 Below are some screen shots from Stellar Caterpillar’s Pinterest Board “Mommy Crafts.” For the young babies create a mobile or 3D nursery art to stimulate baby sight. Her eyes are still developing and she sees movement of objects probably more clearly than their color or shape. Read “What a Newborn Sees” and “Babies’ Eyes and Movement Skill Development” to learn what will stimulate baby’s sight for her age. 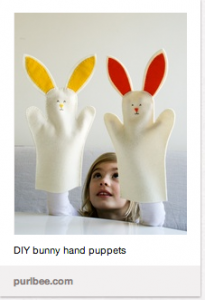 Create hand puppets and read our post “Baby Cruising Fast” for an example of how to use a puppet or stuffed animal to stimulate the motor skill of cruising. 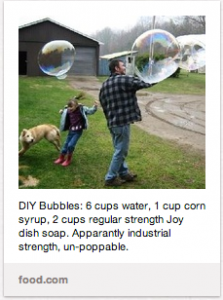 When baby learns to walk make some DIY bubbles for her to chase. Learn some simple home-made crafts for activities that motivate movement and inspire learning which is beneficial for the development of your baby. Stellar Caterpillar would like to wish parents and babies a very Happy Thanksgiving! For our readers around the world who do not celebrate this holiday, here is your chance to learn a few holiday songs from the USA. 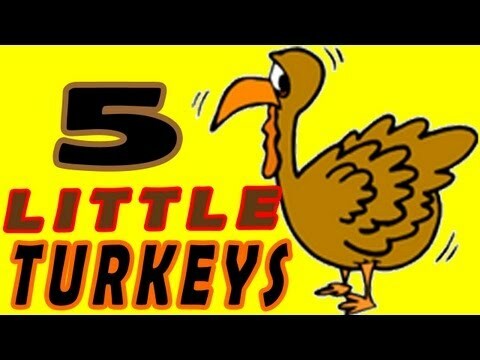 We know moms will be busy in the kitchen this week, so we thought we would share a few Thanksgiving songs to sing with baby and the family and while you work in the kitchen. 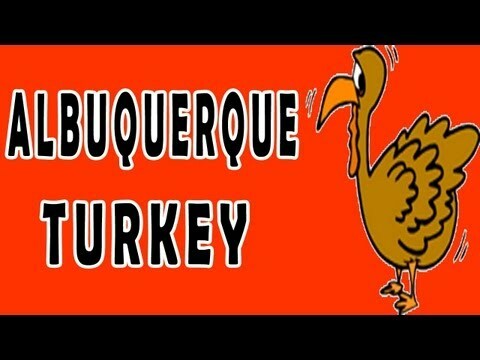 The first two songs, ‘Five Little Turkeys” and “Albuquerque Turkey,”are from The Learning Station’s youtube channel. The third song is the holiday classic “Over the River and Through the Woods” from Kiboomu’s youtube channel. We will be back this weekend with more articles on babies and motor skill development. Which song is baby’s favorite? Please leave a comment and let us know!